with n the number of electrons exchanged, F Faraday’s constant (96485 C/mol) and Eemf the thermodynamic equilibrium cell potential (also referred to as ΔV). Bacteria can perform this electron transfer on several ways, but overall, two main classes of microbial energy metabolism are known: respiration and fermentation. Which type of energy metabolism is used, depends on the properties of the bacteria and the available electron donor and acceptor. During respiration, substrate is oxidized with subsequent liberation of protons and electrons. These electrons are generally deposited on a NAD+ molecule, which is reduced to NADH. This NADH is re-oxidized at NADH dehydrogenase, and the electrons subsequently follow the electron transport chain (Figure 1.3). Electrons and concomitantly protons can be transported through the NADH dehydrogenase, ubiquinone, coenzyme Q or cytochrome. Every subsequent component in this chain has a higher potential than the electron donating component. The energy released during the electron transport enables bacteria to pump protons outwardly to the periplasm. Thus a proton motive force is generated, enabling activity of ATP synthase and hence the formation of ATP. All electrons not captured for growth within the bacteria can theoretically be transported to the electron acceptor, with concomitant conversion of carbonaceous substrate to CO2. If the environment shifts towards a lower redox potential, the normal final electron transferring component can no longer be used, causing the bacteria to either divert electron flows over more reduced compounds (read gain less energy out of the electron transport chain or convert from a respiratory to a fermentative metabolism. Fermentative metabolic pathways are used when no readily available electron acceptors are present in the bacterial environment. During fermentation, bacteria will deposit part of the liberated electrons on the oxidized substrate and hence form reduced metabolites such as ethanol and acetate but also hydrogen and methane. The use of respiration pathway in MFCs was investigated by (Kim et al. 2004). They observed that the generation of electrical current from a MFC was inhibited by various inhibitors of the respiratory chain. 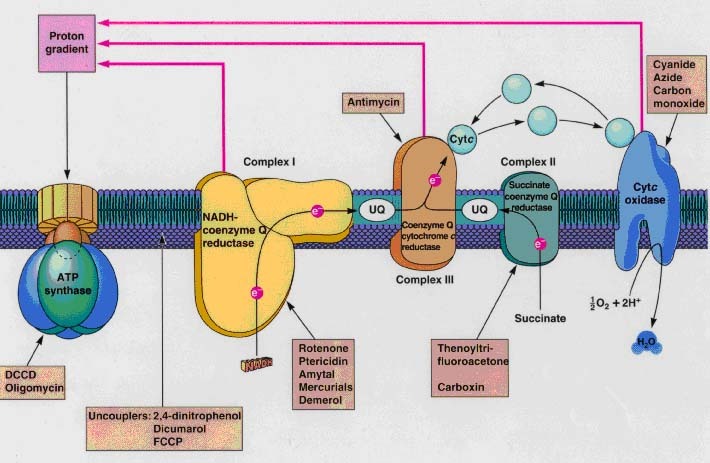 The electron transport system in their MFC utilized NADH dehydrogenase, Fe/S proteins and quinones as electron carriers, but does not use site 2 of the electron transport chain or the terminal oxidase. Processes using oxidative phosphorylation have regularly been observed in MFC, yielding high energy efficiencies (Rabaey et al. 2003). Examples are consortia containing Pseudomonas aeruginosa, Enterococcus faecium (Rabaey et al. 2004) and Rhodoferax ferrireducens (Chaudhuri & Lovley 2003). During fermentation the reducing equivalents (e.g. NADH2, ferredoxin,…) originating from the oxidation of pyruvate to acetyl-CoA need to be re-oxidised to become available again for the bacteria. This can be done by the production of fermentation products like lactate, acetate, butyrate, ethanol,… but hydrogen can also be produced. However, the liberation of hydrogen from these reducing equivalents becomes only thermodynamic feasible if the partial pressure of hydrogen is lower than 60 Pa (Angenent et al., 2004). Furthermore, approximately 2/3 of the electrons remain in the produced fermentation products such as acetate, while maximum 1/3 can theoretically be used to generate current (Logan, 2004). The 1/3 electrons are possibly available for electricity generation since the hydrogenases, that generally use the electrons to produce hydrogen gas, are often situated at places accessible from outside by mobile electron shuttles in the periplasm (McKinlay & Zeikus 2004).In microbial fuel cells, methane production has also repeatedly been observed (Kim et al.) indicating that the bacteria do not fully use the anode. The fermentation products are further oxidized at low anode potential by anaerobic bacteria such as Geobacter species, capable to withdraw electrons from acetate in MFC conditions (Bond & Lovley 2003). Does the anode potential affects the microbial energy potential? yielding a ΔG of only -19 kJ/mol. The amount of energy available for the bacteria to grow is very low in that case. In the anode compartment of an MFC no oxygen is present, except the oxygen diffusing through the membrane adjacent to the anode. If an anode is available with a higher potential than for example sulphate present in the feed stream, the energetic gain will be much higher for bacteria that can deliver to the anode. Hence, the anode will become the preferred electron acceptor. If however the anode potential is to low, electricity production will cease and fermentation processes will start. How does the electron transfer occur? - Nanowires or electrically conductive bacterial appendages (Reguera et al., 2005) The three pathways may interlink, rendering the distinction less strict. MFCs operated using mixed cultures currently achieve substantially greater power densities than those with pure cultures. In one recent test, however, an MFC showed high power generation using a pure culture, but the same device was not tested using acclimated mixed cultures and the cells were grown externally to the device. Community analysis of the microorganisms that exist in MFCs has so far revealed a great diversity in composition. We believe, based on existing data, and new data from our individual laboratories, that many new types of bacteria will be discovered that are capable of anodophilic electron transfer (electron transfer to an anode) or even interspecies electron transfer (electrons transferred between bacteria in any form).